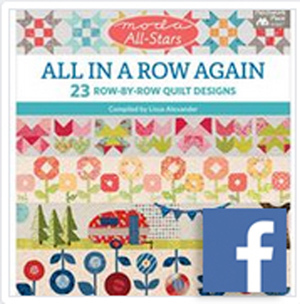 Once again, the Moda designers and Martingale have combined creative forces to bring you ‘All in a Row’ volume 2- a book packed with original and fun ideas for row- by- row quilts! My row was inspired by the two beautiful Oak trees we have growing in our back garden (that sentence conjures up images of vast rolling acres, doesn’t it? So not the case!). The trees provide shade and shelter for so many birds, bugs and bats and are such a pleasure to live alongside in our busy, town garden. All proceeds from the book are being donated to a very worthy cause, ‘Give Kids the World Village‘ which gives very sick children and their families a much needed free holiday. 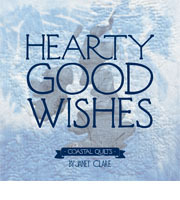 Quilting inspiration and doing good in the world all by treating yourself to a new book! To join in the fun and have a chance to win some of the goodies generously donated by Moda and Martingale be sure to visit the All in a Row Facebook page. And I have a free e-book of ‘All in a Row Again’ for one lucky reader- just leave me a comment! Now, pop over to my Moda friends Corey and Pat for more fun and chances to win! This post is filed under Other. You can follow any responses to this entry through the RSS 2.0 feed. You can leave a response, or trackback from your own site. Great row! Thank you for the giveaway. Lovely row – loved the trees!! Thanks for the giveaway. Will have to start rowing again soon. Thanks for the chance to win. Looks like a fun book. We don’t have oaks in our yard. But there is an elm, an alder and four volunteer dogwoods that I love dearly. Their presence means “shade garden” for me, and it’s fun discovering plants that require little full sun. Where would we all be without trees! Thanks for the rowing fun. Love the tree! Thanks for a chance to win! Your row is lovely! Thanks for a chance at a fun giveaway too. How lovely, all your designs are beautiful! We are fortunate to have an oak tree in our garden and we also have a large Monkey Puzzle tree. Can never have enough row patterns! I always enjoy reading your modest comments about where you live and your business. You are a superstar! Love your work! I love your row! We have 1/2 acre of woods and I’ve identified 6 different types of oaks on our property. My favorite trees! I like you trees, I would make all a different colors for my row. If I should win. Thanks for the chance. What a beautiful inspiration! I also have property with trees and beauty which inspire me. Thank you for having this giveaway! The Row by row has taken a while to land in my list of to-do but now that it’s here, I’m really excited. Thanks for the opportunity! I am a lover of nature, camping / glamping, so I would add your row to my camper row. I love your row and would love to win the book! Thanks for the opportunity. Great row! Thanks for sharing. Great tree row! I loved the first volume of All in a Row, so I look forward to seeing the 2nd one! I love oak trees in the fall! Beautiful oak! Thanks for sharing the story of your inspiration. This is a lovely new book! I’ve never done a Row by Row. Looks like fun! The oaks were such great inspiration. Nicely done. Thanks for the chance to win. This looks like a wonderful book full of fabulous designs, love your oak tree. Thanks for giveaway. We live in the mountains and have lots of trees. The hemlocks are my favorite. LOve your new line and can’t wait to get my hands on the child’s Artisan Apron pattern! I love this book. Thank you for the chance to win. I love trees (except for their pollen). Fabric trees don’t have any, so they are my favorite. Love your beautiful oak tree! Thanks for the chance to win! I love trees and Autumn is my favorite time of the year…except that I have to spend time away from quilting to clear all of those beautiful falling leaves! What a lovely row and for a great cause too! like hearing about your fabric and use of color, thanks for sharing and the giveaways! Thanks for the chance to win the ebook. I loved the first row-by-row (once I got the corrected copy) and can’t wait to see the new one. I love this row by row book!! Can’t wait to make a row by row Quilt. 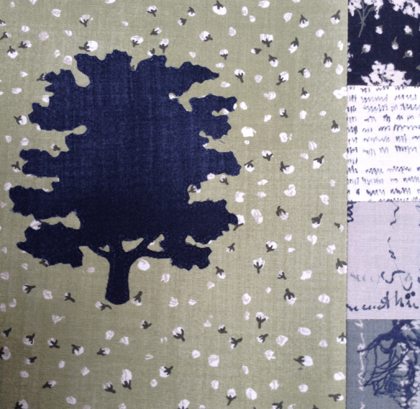 I love trees – and this oak tree applique is lovely! The blog hop is a great intro to the Row by Row experience. Love this book. Thanks for the chance to win. I have not participated in a row by row but would like to start and it looks like this book would be wonderful to start with. Thanks for sharing the story of your inspiration. This is a lovely new book>Love to win it! I’ve never made a row quilt, but I’d really like to try one, and this book is great inspiration! We also have a huge oak tree at each end of our house. I love them! A little less right now as the ground is covered in both acorns and tons of leaves needing to be raked. I would love to win this book. Oak trees are my absolutely favorite. They remind me of my father who was a forester. Gorgeous tree – beautifully done! Love the tree! Thanks for the chance! Love your row with the oak leaves! Love oak trees. They’re so majestic. Thanks for the chance to win, wonderful book. Trees!! I adore trees and leaves – and most of my xmas decorations are trees, including table runners. Thx for the chance to win! Can’t wait to see what the new row by row will look like! I love your row! Blue is my favorite color. The mighty oak tree, how can you go wrong with that. And I love their leaf shape… thanks for the opportunity. I am so glad I found this fun post from BUnny Tales and now will once again be able to hop to so many amazing web sites and see what everyone is up to now. I’d love to win the book! So many cute ideas!! Love doing the row by rows. So much creativity in each row. I love your beautiful designs. Thank you for your contribution to the Row by Row new book. Love your row. Thanks for sharing with us. thanks sew for energies and fun! Nice row! Thanks for the opportunity to win. I LOVE trees! Your oaks look so sturdy and strong. Thanks for the chance to win. The new Vol. 2 looks exciting. It’s inspiring me to sew up some table runners. Great row! Can’t wait to get my hands on this book!Thank you for the giveaway! What a great new book. You are a talented designer-love trees. What a great book! I need to make a row by row quilt! I loved vol 1! I know vol 2 will be just as great! Winning the e-book would be great. This is awesome. Going to try the brother scan and cut to cut this out! Can’t wait to get going! What a darling book! Love the tree row! So many great ideas all in one book! It is fun to mix up a bunch of rows into something unique. Janet, your Oak tree is beautiful. Indeed it’s always such a pleasure to relish time in the garden, or under a lovely Oak or other greenery. Thank you for sharing. all in a row is so cute! Your trees sound lovely (except for the bats) and I like your applique version! I made your Bunny Playdate row from the first book into a table runner. I would love to win a copy of this book! Your design is so beautiful, I can already picture using this special fabric I have. Thank you so much for sharing! I would love to win the All In A Row Again Book. I love your oak trees as they remind me of the beautiful Live Oak trees that grow where I grew up in Chico, CA. This will definitely be one of my first rows. Oak trees are the best as they provide shade in the summer and mulch for the gardens. Thanks for the giveaway. I love oak trees, so your row is really neat! Love getting new ideas!! Beautiful row. I can’t wait to try it. Having a couple of trees is probable just enough! We have lots of birds, bats, bugs and LEAVES. They are hard to keep up with now that it’s fall, and they’re falling. Love the new book. Row quilts are fun. I like big old oak trees. We just have maples in our yard.Looking forward to seeing this fun book. What fun would be had making projects out of this book. Thanks for the chance to win it!! Great row. Thanks for sharing. We have three mature trees that I love in our yard. This time of year I don’t feel the love when I’m raking the leaves. I grew up with a yard full of oaks, right outside my bedroom window. I loved waking up to the view, and now my adult bedroom window looks out on our little woods in the backyard! What a super Row! Love your row!! Thank you! I love all kinds of trees. We have 3 acres of wooded property and it is fun to see all the different critters that come and go! Looking forward to seeing all of the rows. Love most trees, especially oaks. So big and majestic. 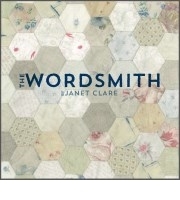 I am beginning to really like this book and considering on making a quilt with the rows! These rows are so cute. I love your row and your style of quilting, in general. I’m signing up for your email list and looking forward to the inspiration that comes my way! Love your tree row idea – thank you for a wonderful giveaway! Thanks for the great giveaway. Loved the first book. I’ve loved both of the Row by Row books. I own the 1st one and would love to own the 2nd. Love your trees. We do live among trees. We cleared enough to build our house in deep East Texas. Can’t have enough trees. My husband doesn’t especially like all the leaves he rakes though. 🙂 I also love your entire row. Love the banner at the top of your page! Thank you for this opportunity to win a great book. Would love to make a row quilt, they look fun. I’ve not made any row quits but have seen some really cute rows! Row by Row quilts are favorites of mine. I am having fun “hopping” to see the rows. I love the row by row quilts- small sections make an interesting quilt. Thank you for being part of this! I love trees also. Lots of fun ideas in the new book. Thanks for giveaway! Great row. Thanks for the inspiration. I’d love to win this book and get more ideas of how to put my 2017 rows together. PLUS try out these new rows! I love trees, especially oaks – lucky you to have them in your garden. Have been wanting to make a ‘row’ quilt and your pattern would be a perfect addition! Cool trees row. Looks like a fun book. Thanks for the chance to win! Love the trees, looks like a great book! I would love to make these rows! Oh the oak trees – brings me back to one I was a kid. Our home was surrounded by massive oak trees. Wonderful looking tree. I loved the first row book and expect this one will be beautiful also. I love the majestic Oak tree, but unfortunately they don’t grow here in Utah. Love your oak tree!! I also have two in my yard. The one up against our house is about 300 yeanrs old. If I dont win I will have to get this book for your oak tree ideas! What a great cause to support as well! I love your unique style of using the row. Love the tree!And the colors so much! I would sure love to win a copy of the book. Looks like lots of great inspiration! I haven’t tried a “row” quilt before but all of the great contributions by the designers are making me think that 2018 would be a great time to try one out. Love the book. Love your row. Love trees. They inspire day dreaming, protection, climbing, games & of course filter our air. I have the first book & look forward to this one. Looking forward to see this 2nd row book! Looks like a reallyvbook to use. Love the flowers of rows!! I appreciate your patterns and generous tips on creating more successfully. Thank you ???? I’ve never done a row by row quilt and this looks like a wonderful way to get a new quilt and help others too. Well done! The book looks interesting. I am enjoying this blog hop. The proceeds of the book sale are going to a great cause. Great tree! Down here in Central Texas the trees look a little shrubby compared to the ones up North. This new book looks great, and helping others at the same time! Nice looking tree! What a lovely row you have designed. The birch trees on my way home from quilt group are especially colourful this year. This would b great in an Autumn themed color scheme too! Love it! Can’t wait for the new book! Your tree would make a great family tree. Great follow-up to the first book. Fantastic oak trees and giveaway! Thanks. I love big mature trees. My boyfriend has an oak on his front lawn but it’s not quite to the ‘towering’ stage yet. Your oak row is fantastic. This is beautiful……would love to try a row quilt! Oak trees are my favorite and I love your rendition. Thanks for the giveaway! Very nice block! Thanks for the opportunity to win. Lovely book! thanks for your contribution! I really like your row…would make a great table runner too. Thanks for sharing the giveaway too! Your tree has me thinking of nests, tire swings, tree houses, hammocks…laying on the grass under the branches and watching the leaves rustle in the breeze. Thanks! 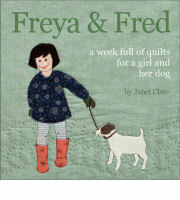 I love row quilts and I would love to win this book too! Thanks for the chance! Your inspired oak tree block is wonderful! I live in the country surrounded by hundreds of oaks & other trees. Brings pleasure to every single day watching nature’s activities amidst the wooded acreage. This is my first time here; thanks so much for the generous giveaway and for sharing with us. I love your row and thanks for the giveaway! What a fun row–the book looks great! Trees are always fun to add to pictures. What a great book of patterns–would love to have one! Love the oak trees! This book is filled with wonderful patterns! I love Oak trees, they seem to be like an umbrella that covers what’s underneath. This book sounds amazing, I know it’s filled with so much to try. Thanks for the chance. I love your row and the story behind it. I can’t wait to get this book! Winning it would be great! This book looks fantastic.. would just love to have a copy. dquilterguy48329 (at) prodigy (dot) net. Would love a chance to win the e-book. Your designs are beautiful. Thanks for sharing them with us. Such a great book! I love your oak tree! Wonderful to be able to donate proceeds to a good cause. This is a win win for all. When I was little, my dad had nursery stock around our house. I remember spending hot, summer days in their shade and imagining what the trees would look like fully grown. I’ve always wanted to do a row quilt. I love your block. Living in southern Louisiana we have a lot of beautiful old oak trees. Thanks for the giveaway. Looks like a great book! Love your oak tree! I love all the blocks I have seen so far. 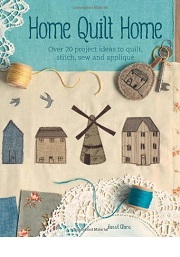 This book would be awesome to add to my quilt book collection. I have learned in the Splendid Sampler that there is no wrong way, to pick or choose or make your blocks, and there is no time limit… I tried to push my way thrubit, but only frustrated myself, and almost chunked the whole thing, when finally I just decided to just do my regular things, sew blocks for Sampler as I could, and then go on from there… Then I gained my excitement back again!! If I hadn’t had so many things I wanted & needed to do, or if I sat at my machine all day every day, I could have done it… but that isn’t me… and I had to find myself before I could find the Sampler Blocks within me!! Thank you Janet Clare for your design in Aurifil & the Splendid Sampler! We were all Blessed. And yes, I will finish all 100 plus of mine also!